All national emergency preparedness and disaster response programs, regardless of how well developed they may be from a conceptual and technical standpoint, should be subject to continuous evaluation, especially regarding their organization, material and financial resources, training and staffing, coordination mechanisms, and the availability and functionality of the operational programs. To evaluate the most important areas of these programs, questionnaires should clearly establish the objectives of the evaluation and the basic indicators being used, including key questions related to what is being evaluated. Country’s disaster risk and vulnerability profile. This section should gather information on the most frequent disasters that have affected the country, the population’s vulnerability to the various hazards (geological, hydro-meteorological, and technological, as well as possible hazards associated with social violence), and the country’s available institutional resources to address these situations. It is especially important to check on the existence of laws and regulations regarding human settlements in at-risk areas, the country’s risk management mechanisms, existing community organization models, and disaster response capacity. The general approach of the health sector. 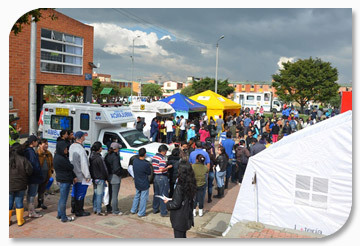 The organization and structure of the health sector should be evaluated, as well as its capacity to respond to disaster situations, the presence of institutions that are included in preparedness and response plans, and coverage of the services provided to the population in both urban and rural areas. It is especially important to find out whether national policy and legislation are in place for dealing with disasters, how the health sector is organized for preparedness and response at the national and regional levels, how, as a regulatory institution, the ministry of health is organized to respond to emergencies and disasters, whether there are sectoral standards and regulations, and whether adequate technical and financial resources are available for rapid action. Evaluation of health preparedness programs. Evaluation should emphasize the operational elements in critical technical areas, such as epidemiological surveillance, basic sanitation, organization of pre-hospital and hospital care, health care in temporary shelters and camps, coordination activities, staff training, and logistics. In evaluating the preparedness of the health sector national disaster management program, it is also important to look at the frequency with which plans and human resources training programs are reviewed or updated. The success of a preparedness program begins with identifying the risks associated with natural hazards and human activity. Risk and vulnerability assessment is an interdisciplinary undertaking of the health sector and the scientific community, and draws on the contributions of seismologists, meteorologists, sociologists, environmental experts, urban planners, and others. Mitigation measures should also be evaluated as an integral part of a preparedness evaluation. The percentage of health facilities and water and sewerage systems that have been assessed for vulnerability should be determined, and projections regarding their functioning after a disaster ascertained. Although the primary purpose of evaluating preparedness is to examine the processes themselves, it is absolutely essential to evaluate the impact of preparedness programs after a disaster actually occurs. The results and potential to the effectiveness of response should be evaluated for each component of the preparedness program, using indicators related to the program’s objectives and components. The analysis should be self-critical, and the lessons learned should be compiled. Organizational and leadership capacity in the sector. What needs to be evaluated here is whether the program’s organization and structure were adequate to the challenges posed by the disaster. The operating capacity of the specific disaster health programs. What must be evaluated is the timeliness and effectiveness of interventions to reduce morbidity and mortality and mitigate the disaster’s effects on the population. Coordination with the institutions within and outside the sector. This will look at the capacity and relations between the regional, national, and local levels, as well as with institutions within and outside the sector, including agencies providing humanitarian assistance in health and nongovernmental organizations. The cost of operations. To evaluate the cost of operations and the efficiency with which financial resources were used. Each of these categories implies considering the human resources responsible for actions, the logistical and financial resources available for operations, the quality of the operations, and the level of support provided by the authorities in charge. Review a list of key considerations that has been put together in anticipation of the evaluation of the health sector’s preparedness. The results of this self-critical analysis should be drawn on to improve preparedness programs. The Caribbean Self Assessment Tool for Disaster Risk Reduction in the Health Sector is recognized as one of the best systems available to rapidly provide a snapshot of the status of preparedness and mitigation in the health sector.